Raith Rovers management team John McGlynn and Paul Smith have made another move in the January transfer window, signing Craig McGuffie on loan until the end of this season from SPFL Championship side Ayr United. Craig (21) is a wide midfielder who progressed through the age groups in the Ayr United Academy. 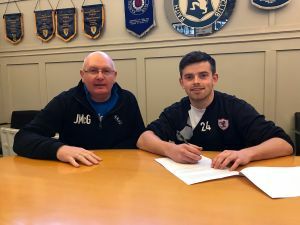 He signed professional forms for the Honest Men at the start of the 2014-15 season, going out on loan to junior side Glenafton Athletic midway through that season. He then spent the majority of the following season on loan at Glenafton, returning to Somerset Park to make his first team debut at the end of season 2015-16. In total Craig has played in 95 matches for Ayr United (25 of them starts), scoring 7 goals – the most notable being against Hibs in the Scottish Cup, with that strike being voted goal of the competition. Welcome to The Rovers Craig!